SAN TAN VALLEY, AZ – Ricky Weiss broke Bobby Pierce’s stranglehold on the 13thAnnual Keyser Manufacturing Wild West Shootout presented by O’Reilly Auto Parts victory lane by topping Saturday afternoon’s 30-lap feature atop the 1/3-mile FK Rod Ends Arizona Speedway clay oval. Brandon Sheppard and Kyle Beard led the Black Diamond Super Late Models presented by M&W Transport feature to the green flag with Sheppard jumping into the early lead with third-starting Weiss immediately moving into second. Sheppard and Weiss wasted little time establishing a two-car race, slipping away from the field in short order. Weiss closed in and stuck his nose under Sheppard on the eighth round to take command. The duo raced through traffic a near straightaway ahead of the rest of the field until the race’s only caution flew after 19 laps. Weiss took off once again, leaving Sheppard to fend off his foes for second. Sheppard began closing back in over the final handful of laps but never could cut the lead to less than five car-lengths. Chris Simpson rounded out the podium in third behind Weiss and Sheppard with Chase Junghans slipping by Pierce on the 26th lap to claim fourth. Pierce rounded out the top fiver after winning the first three rounds of competition. Already assured of a $10,000 bonus courtesy of the Keyser Quarter Million Challenge, Pierce still has a shot of boosting it to $25,000 win one win in the final two events or possibly $100,000 by winning each of the final two. The Mesilla Valley Transportation/Border International Modifieds presented by Arizona Differential offered up a pair of 15-lap main events with D.J. Shannon and Dereck Ramirez keeping up the trend of no repeat winners. Shannon raced from ninth to win the first feature ahead of Rodney Sanders and Joe Duvall while Ramirez beat Tyler Peterson and Darrell Nelson to the stripe in the second main event. The RHRSwag.com X-Mods presented by Barnett Harley-Davidson contested a pair of 15-lap features as well with Brock Gronwold and Jaime Torres making their way to Hoker Trucking Victory Lane. Gronwold fought off Cole Searing and Steve Muilenberg to win the first feature with Torres besting Skyler Smith and Lucas Rodin in the second feature event. 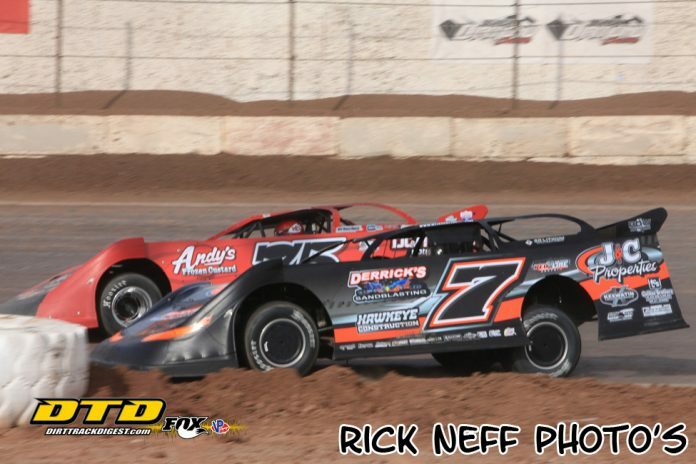 The Wild West Shootout continues at FK Rod Ends Arizona Speedway with Round Five of Six on Saturday night with the final round set for Sunday at 5:00 p.m.
A $5,000 winner’s share is up for grabs for the Super Late Models through the opening five nights of competition before the stakes are upped to $14,000-to-win for the January 14 Shaw Trucking finale. Advance tickets may be purchased online at www.wildwestshootout.net/schedule/ and ticket pricing/purchasing information can be found at www.wildwestshootout.net or by calling the Wild West Shootout office at 520-664-2074. Wild West Shootout Hotel Information can be found at http://www.wildwestshootout.net/fan-info/lodging-2/ or by calling Hilton Phoenix/Mesa at 480-833-5555. The Hilton Phoenix/Mesa is located at 1011 West Holmes Avenue in Mesa, AZ. Group 1: 1. 32p-Bobby Pierce 14.614, 2. B5-Brandon Sheppard 14.654, 3. 42s-Don Shaw 14.705, 4. 97-Cade Dillard 14.801, 5. 11-Pat Doar 14.841, 6. 2s-Stormy Scott 15.132, 7. 942-Steve Isenberg 15.455, 8. 46-Darren Coffell 15.529, 9. 15d-Justin Duty 15.655, 10. 6T-Terry Carter 16.221, 11. 44L-Brandon Lewis 19.550. Group 2: 1. 18-Chase Junghans 14.718, 2. 86-Kyle Beard 14.720, 3. 91-Tony Toste 14.909, 4. 7mm-Michael Maresca 14.962, 5. 28m-Jimmy Mars 14.963, 6. 1g-Garrett Alberson 15.016, 7. 71rc-R.C. Whitwell 15.055, 8. 76-Blair Northdurft 15.067, 9. 75-Terry Phillips 15.253, 10. 6rt-Ricky Thornton, Jr. 15.267, 11. 23-Brad Williams 15.752. Group 3: 1. 7-Ricky Weiss 14.886, 2. 32-Chris Simpson 14.917, 3. 51-Joey Moriarty 14.959, 4. 32b-Cody Laney 15.219, 5. 91p-Jason Papich 15.430, 6. 14m-Dean Moore 15.527, 7. 37-Rob Mayea 15.622, 8. 28-John Cornell 15.645, 9. 44-Cole Schill 15.792, 10. 38-Thomas Hunziker 16.185, 11. 78s-Steve Stultz 16.538. Group 4: 1. 1p-Earl Pearson, Jr. 15.023, 2. 2-Brandon Overton 15.096, 3. 37w-Scott Ward 15.338, 4. 15v-Kolby Vandenbergh 15.361, 5. 71-Hudson O’Neal 15.372, 6. 0-Scott Bloomquist 15.579, 7. 3x-Lyndon Bolt 15.821, 8. 17-Billy Franklin 16.025, 9. 83-Chaz Baca 16.430, 10. 10n-Rob Sanders 16.569, 11. 7w-Richard Wallace 16.636, 12. 24-Rick Ortega 16.807. Heat One (8 Laps): 1. B5-Brandon Sheppard, 2. 32p-Bobby Pierce, 3. 97-Cade Dillard, 4. 42s-Don Shaw, 5. 2s-Stormy Scott, 6. 11-Pat Doar, 7. 942-Steve Isenberg, 8. 15d-Justin Duty, 9. 6T-Terry Carter, 10. 44L-Brandon Lewis, 11. 46-Darren Coffell. Heat Two (8 Laps): 1. 86-Kyle Beard, 2. 18-Chase Junghans, 3. 7mm-Michael Maresca, 4. 28m-Jimmy Mars, 5. 1g-Garrett Alberson, 6. 6rt-Ricky Thornton, Jr., 7. 91-Tony Toste, 8. 71rc-R.C. Whitwell, 9. 75-Terry Phillips, 10. 76-Blair Northdurft, 11. 23-Brad Williams. Heat Three (8 Laps): 1. 7-Rick Weiss, 2. 32-Chris Simpson, 3. 91p-Jason Papich, 4. 32b-Cody Laney, 5. 51-Joey Moriarty, 6. 14m-Dean Moore, 7. 37-Rob Mayea, 8. 44-Cole Schill, 9. 28c-John Cornell, 10. 38-Thomas Hunziker, 11. 78s-Steve Stultz. Heat Four (8 Laps): 1. 0-Scott Bloomquist, 2. 2-Brandon Overton, 3. 71-Hudson O’Neal, 4. 1p-Earl Pearson, Jr., 5. 15v-Kolby Vandenbergh, 6. 3x-Lyndon Bolt, 7. 10n-Rob Sanders, 8. 17-Billy Franklin, 9. 83-Chaz Baca, 10. 24-Rick Ortega, 11. 7w-Richard Wallace. First “B” Main (12 Laps): 1. 2s-Stormy Scott, 2. 11-Pat Doar, 3. 51-Joey Moriarty, 4. 44-Cole Schill, 5. 37-Rob Mayea, 6. 46-Darren Coffell, 7. 942-Steve Isenberg, 8. 28c-John Cornell, 9. 14m-Dean Moore, 10. 38-Thomas Hunziker, 11. 78s-Steve Stultz, 12. 44L-Brandon Lewis, 13. 6T-Terry Carter. Second “B” Main (12 Laps): 1. 6rt-Ricky Thornton, Jr., 2. 1g-Garrett Alberson, 3. 71rc-R.C. Whitwell, 4. 75-Terry Phillips, 5. 15v-Kolby Vandenbergh, 6. 91-Tony Toste, 7. 10n-Rob Sanders, 8. 76-Blair Northdurft, 9. 3x-Lyndon Bolt, 10. 23-Brad Williams, 11. 83-Chaz Baca, 12. 7w-Richard Wallace, 13. 17-Billy Franklin, 14. 24-Rick Ortega. “A” Main (30 Laps): 1. 7-Ricky Weiss, 2. B5-Brandon Sheppard, 3. 32-Chris Simpson, 4. 18-Chase Junghans, 5. 32p-Bobby Pierce, 6. 86-Kyle Beard, 7. 91p-Jason Papich, 8. 97-Cade Dillard, 9. 42s-Don Shaw, 10. 2-Brandon Overton, 11. 7mm-Michael Maresca, 12. 6rt-Ricky Thornton, Jr., 13. 0-Scott Bloomquist, 14. 32b-Cody Laney, 15. 2s-Stormy Scott, 16. 71-Hudson O’Neal, 17. 1g-Garrett Alberson, 18. 51-Joey Moriarty, 19. 44-Cole Schill, 20. 75-Terry Phillips, 21. 11-Pat Doar, 22. 28m-Jimmy Mars, 23. 1p-Earl Pearson, Jr., 24. 71rc-R.C. Whitwell. Qualifying Group One: 1. 91-Joe Duvall 16.693, 2. 20-Rodney Sanders 16.827, 3. 111-Bumper Jones 17.099, 4. 71s-Dustin Strand 17.128, 5. 6-Casey Skyberg 17.174, 6. 8a-Al Giesbrecht 17.182, 7. 6d-Dylan Goplen 17.185, 8. 02-Cody Scholpp 17.188, 9. 32-D.J. Shannon 17.231, 10. 44-Christy Barnett 17.243, 11. 9L-Vince Lucas 17.392, 12. 131-Royal Jones 17.420, 13. 22-Davey Mills 17.445, 14. 57-Duke Erickson 17.466, 15. 71-Jessie Hoskins 17.486, 16. 71k-Kenny Wallace 17.491, 17. 86-Kyle Beard 17.515, 18. 54-Carlos Ahumada, Sr. 17.694, 19. 9-Jimmy Ray 17.740, 20. 51-Alex Guthmiller 17.880, 21. 5b-Brenda Kirby 17.947, 22. 292-Ryan Roath 18.491, 23. 4-Blake Higginbotham 18.958. Qualifying Group Two: 1. 442-Darrell Nelson 16.583, 2. 30-Matt Leer 16.738, 3. 4R-Dereck Ramirez 16.765, 4. 4w-Tyler Wolff 16.783, 5. 10-Chad Olson 16.840, 6. 65x-Carlos Ahumada 16.958, 7. 1tpo-Tyler Peterson 16.993, 8. 2a-Casey Arneson 17.002, 9. 17-Stoney Kruk 17.023, 10. 98-Alex Stanford 17.055, 11. J17-Jacob Gallardo 17.112, 12. 2-Don Gumke 17.146, 13. 5k-Chaz Baca 17.169, 14. 18z-Zane Devilbiss 17.237, 15. 33-Steve Muilenburg 17.264, 16. 7-Ken McCleskey 17.332, 17. 75-Cody Skytland 17.346, 18. 19sb-Lance Mari 17.376, 19. D25-David Tanner 17.407, 20. 36-Ryan Cousins 17.458, 21. 18k-Jacob Pace 17.902, 22. 196-Joey Olsvhowka 18.364. “A” Main One (15 Laps): 1. 32-D.J. Shannon, 2. 20-Rodney Sanders, 3. 91-Joe Duvall, 4. 71s-Dustin Strand, 5. 111-Bumper Jones, 6. 6d-Dylan Goplen, 7. 02-Cody Scholpp, 8. 86-Kyle Beard, 9. 6-Casey Skyberg, 10. 131-Royal Jones, 11. 57-Duke Erickson, 12. 9-Jimmy Ray, 13. 71-Jessie Hoskins, 14. 5b-Brenda Kirby, 15. 51-Alex Guthmiller, 16. 44-Christy Barnett, 17. 9L-Vince Lucas, 18. 54-Carlos Ahumada, Sr., 19. 22-Davey Mills, 20. 8-Al Giesbrecht, 21. 4-Blake Higginbotham, 22. 71k-Kenny Wallace. DNS: 292-Ryan Roath. “A” Main Two (15 Laps): 1. 4r-Dereck Ramirez, 2. 1tpo-Tyler Peterson, 3. 442-Darrell Nelson, 4. J17-Jacob Gallardo, 5. 98-Alex Stanford, 6. 33-Steve Muilenburg, 7. 18z-Zane Devilbiss, 8. 5k-Chaz Baca, 9. 4w-Tyler Wolff, 10. 75-Cody Skytland, 11. 65x-Carlos Ahumada, 12. 36-Ryan Cousins, 13. 2-Don Gumke, 14. 19sb-Lance Mari, 15. 7-Ken McCleskey, 16. 18k-Jacob Pace, 17. 196-Joey Olsvchowka, 18. D25-David Tanner, 19. 17-Stoney Kruk, 20. 30-Matt Leer, 21. 2a-Casey Arneson, 22. 10c-Chad Olson. Qualifying Group One: 1. 10-Cole Searing 18.411, 2. 777-Mike Rosales 18.479, 3. 20-Austin Ellis 18.505, 4. 2g-Brock Gronwold 18.507, 5. 17-Lance Schill 18.704, 6. 22-Matt Heinzerling 18.704, 7. 81x-Matt Spardy 18.795, 8. 0-Matt Gilbertson 18.915, 9. 34-Troy Randall 18.999, 10. 141-Clint Jensen 19.024, 11. 97-Coleman Anderson 19.053, 12. 6c-Calvin Caitlin 19.154, 13. 80-Gerald Vesel 19.245, 14. 39-Steve Muilenburg 19.360, 15. 30-Dewayne Tesch 19.748, 16. 97x-Don Schaefer 19.782, 17. 17x-Rob Moseley 19.796, 18. 32-Eric Haugland 20.265, 19. 7b-Bailey Cousins 20.976, 20. 41J-Josh Jensen NT, 21. 8272-Sherman Barnett NT, 22. 07-Donovan Flores. Qualifying Group Two: 1. 44JT-Jaime Torres 17.790, 2. 16-Jason VandeKamp 17.947, 3. 1s-Scott Bintz 18.105, 4. 44-Austin Hunter 18.145, 5. 16x-Skyler Smith 18.159, 6. 37x-Sketter Estey 18.225, 7. 19-Lucas Rodin 18.226, 8. 3J-Josh Cain 18.301, 9. 5c-Preston Carr 18.354, 10. 19d-Dane Durbin 18.383, 11. 10c-Cole Haugland 18.489, 12. 56-Terry Bahr 18.564, 13. 27x-Calvin Iverson 18.671, 14. 171-Jed Smith 18.689, 15. 57-Nathan Higginbotham 18.837, 16. 17e-Neil Eckert 19.436, 17. US-Jonathan Olmscheild 19.618, 18. 65-Ron Reed 20.031, 19. 88-Nathan Smith NT, 20. 138-Jess Brekke NT, 21. 15s-Wade Skindelien NT. “A” Main One (15 Laps): 1. 2g-Brock Gronwold, 2. 10-Cole Searing, 3. 39-Steve Muilenburg, 4. 17-Lance Schill, 5. 0-Matt Gilbertson, 6. 777-Mike Rosales, 7. 22-Matt Heinzerling, 8. 30-Dewayne Tesch, 9. 97x-Don Schaefer, 10. 32-Eric Haugland, 11. 80-Gerald Vesel, 12. 7b-Bailey Cousins, 13. 17x-Rob Moseley, 14. 141-Clint Jensen, 15. 6c-Calvin Caitlin, 16. 8272-Sherman Barnett, 17. 97-Coleman Anderson, 18. 20-Austin Ellis, 19. 07-Donovan Flores, 20. 34-Troy Randall, 21. 81x-Matt Spardy. DNS: 41J-Josh Jensen. “A” Main Two (15 Laps): 1. 44JT-Jaime Torres, 2. 16x-Skylar Smith, 3. 19-Lucas Rodin, 4. 37x-Skeeter Estey, 5. 16-Jason VandeKamp, 6. 3J-Josh Cain, 7. 1s-Scott Bintz, 8. 44-Austin Hunter, 9. 10c-Cole Haugland, 10. 19d-Dane Durbin, 11. 27x-Calvin Iverson, 12. 17e-Neil Eckert, 13. 15s-Wade Skindelein, 14. US-Jonathan Olmscheid, 15. 171-Jed Smith, 16. 5c-Preston Carr, 17. 57-Nathan Higginbotham, 18. 56-Terry Bahr, 19. 65-Ron Reed. DNS: 88-Nathan Smith, 13b-Jess Brekke.